Radium Weed, Euphorbia peplus, is also known as Petty Spurge, Milkweed. The corrosive properties of the sap of Radium Weed have been know to herbalists since Galen in the second century. A well known cure for warts, corns, callouses and sun-cancers. 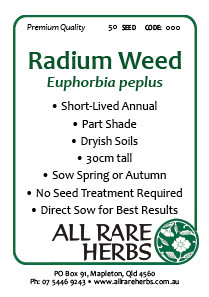 Radium Weed is native to Eurasia and the Mediterranean. Prefers humus rich, moist soils in a protected, sunny position. Drought and frost tender. An annual plant, growing to 0.3m x 0.25m. Readily self- seeds. Be the first to review “Radium Weed, seed” Click here to cancel reply.